In this article I describe in quite some technical detail what happens if you were to place a telephone call to our office. In this article I also describe a failover measure that I set up today. You might want to set up a similar failover measure for your own telephone system. The main point of all of this is, of course, that we use VOIP (voice over IP) telephone lines instead of old-fashioned analog “landline” telephone lines delivered over pairs of copper wires. The VOIP lines cost 85¢ per month which is cheaper than the $40 or so that one would be charged monthly for a landline. 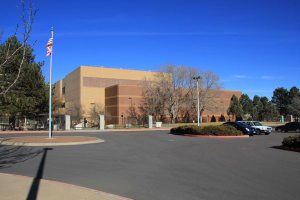 The monthly fee that we pay permits us to use some miniscule fraction of the bandwidth of a VOIP telephone server in a large windowless building (see photograph above) in the Denver Tech Center (DTC). The server has a first port that connects to the PSTN (public switched telephone network) and it has a second port that connects to the Internet. (See block diagram at right.) The building has redundant power feeds from the electric company, redundant Internet feeds from various Internet backbone connectivity providers, man-trap access to the server room, halon fire suppression, and other high reliability things. Our PBX (telephone switch) in our office also connects to the Internet. When it powers up, it seeks out that server to establish a connection through the Internet that is called a SIP trunk. Once the SIP trunk is established, what usually happens is that the SIP trunk remains established for weeks or months at a time. When no telephone calls are going on, there is a small amount of “keep alive” traffic passing back and forth every few seconds through this SIP trunk between the server and our PBX. 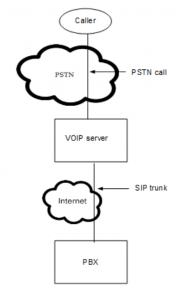 When a telephone call happens, there is more traffic through the SIP trunk. The distance between this windowless building and our office (that is to say, the length of the SIP trunk) is about 25 miles or about 40 kilometers. A traceroute reveals about 15 hops between the two locations. The average ping time between these two locations is about 18 milliseconds. A person desiring to call our office might for example dial our main telephone number which is +1 303 252 8800. Such a call passes through the PSTN and eventually it reaches this VOIP server through its PSTN port. The server then passes a message through its second port and through the SIP trunk to our PBX to set up the telephone call. What I had not given any thought to until today is, should I take some measure to deal with the possibility that an Internet outage might bring down the SIP trunk? For example what if the Internet service to our office were to fail for some period of time? It turns out that the company to which we pay 85¢ per month (VOIP.MS) provides a very sophisticated range of failover options to deal with a “down” SIP trunk. The choices include many options including routing calls to a landline or cell phone, routing calls to a different SIP trunk, and passing the call to voicemail. I chose to set up voice mail. Thus if the SIP trunk for our main telephone line were to go down, a caller would reach a greeting telling him or her that there is some very serious problem at the present time with our telephone service. The greeting would invite the caller to leave a voicemail message. I have it set up so that the voicemail message gets emailed (as an MP3 file) to several people within the firm. This very sophisticated failover-to-voicemail-to-email setup costs us nothing above and beyond the 85¢ per month that we already pay for the telephone number +1 303 252 8800. 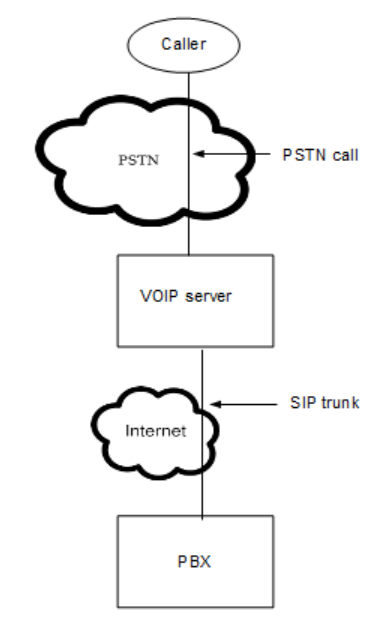 What provision has your office made to deal with incoming calls in the event of a SIP trunk going down? Please post a comment below. « How the “new, safer and simpler log-in” works at the USPTO?